A reclining wheelchair is similar to a light weight wheelchair but has the added feature of being able to recline the backrest. This can be for comfort and, when combined with a tilt feature, can reduce the risk of skin breakdown (ex. pressure/bed sores). 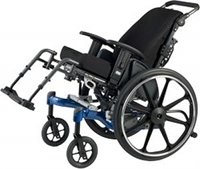 They are commonly used by elderly who are using a wheelchair as their primary means of mobility. Maybe they have had a stroke and are not able to comfortably sit in a standard wheelchair. They need additional support to be both comfortable and safe. Maybe they have been using a light weight wheelchair for several years and are now beginning to have issues with skin breakdown (such as pressure sores/bed sores). Changing to a tilt and reclining wheelchair could be one part to reducing the risk of further skin breakdown. 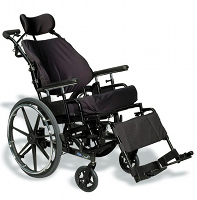 A reclining wheelchair is a wheelchair that has a feature that allows the senior to recline the backrest. They have a higher back and usually a head rest to support the senior while reclined. The leg rests may also have additional calf support. Many will also have a tilt function which is the most effective way to reduce the risk of skin breakdown as it more evenly spreads out their weight. The reclining (and tilt if needed) is usually controlled by a hand brake type system on the handles at the back of the chair. They are designed for elderly who need additional support and/or have skin breakdown issues who will benefit from recline/tilt feature. They are also beneficial for elderly that like to be out and about with others but become drowsy during the day. Being able to tilt and recline allows them to be more comfortable for short periods without having to lay down in bed. 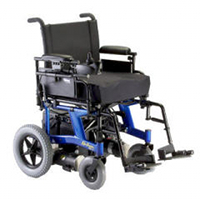 Some models can be self propelled but they are heavier than light weight wheelchairs and are not as easy to maneuver. Some may simply have four small wheels which makes it difficult to propel with arms/hands. They are also made to accommodate more specialized seating and positioning accessories - more advanced cushions, backrests and head rests. Solid seat pan - To provide adequate support for the cushion. Adjustable armrests - It's more comfortable for the elderly if the armrests can be adjusted. This is especially true in the long run as they may change to a different cushion which may be shorter or taller. Removable or flip out arm rests - Makes it easier to transfer in/out of wheelchair. Tilt - Tilt is more effective at reducing risk of skin breakdown in a wheelchair than just recline (in fact, reclining can often increase shearing forces on skin which increases the risk of skin issues). Good cushion - It would be beneficial to have a good cushion made out of air/gel that reduces risk of skin breakdown. Anti-tippers - Prevents wheelchair from tipping over backwards. Calf support - When the elderly are reclined/tilted back, their legs will often fall off the footrests and behind them. This puts them at risk for nerve damage. A calf support will prevent this problem. Foot brakes - Allows caregivers to apply the brakes with their foot when they are pushing the wheelchair. There are three basic measurements used in fitting a reclining wheelchair. Other measurements may be needed depending on the features and design of reclining wheelchair. Depending on the ability of the senior, the wheelchair can be propelled by the senior or the caregiver. 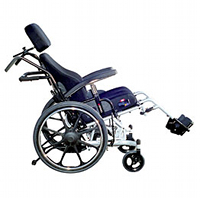 For self propelling, it is similar to a light weight wheelchair. They senior locks the brakes and transfers in. 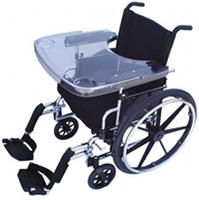 A reclining wheelchair has a few additional features from a light weight wheelchair. The tilt/recline features are usually operated with a hand brake style lever - squeeze the lever and the wheelchair can tilt or recline. Let the senior know you will be changing their position. Some have a foot brake operated by the person who pushes the wheelchair (and not the user). This is for seniors who are not going to be self propelling the wheelchair. A reclining wheelchair costs $1200-4000+ depending on the features and level of customization needed. Transport wheelchair - A portable lightweight travel wheelchair designed for pushing elderly who cannot walk long distances. Light weight wheelchair - A wheelchair for more regular daily use - two large wheels and two small wheels make it possible for the elderly to self-propel. Motorized wheelchair - A battery powered wheelchair for elderly who have difficulty self propelling a manual light weight wheelchair. Shower wheelchair - A wheelchair designed to get wet and be taken into an accessible shower.